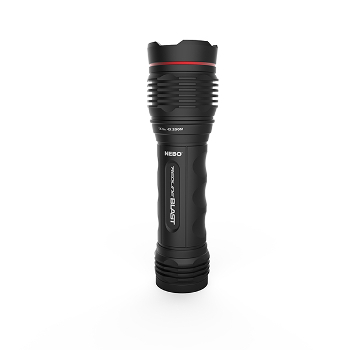 he brightest flashlight ever created by NEBO is here – the REDLINE BLAST. With 1,400 lumens of high intensity light, this must-have flashlight can throw a spectacularly bright beam over 260 meters. The BLAST is completely waterproof and ready for any weather condition. Want more? How about a 4x zoom and 5 light modes (high, medium, low, defensive strobe & flashing beacon).